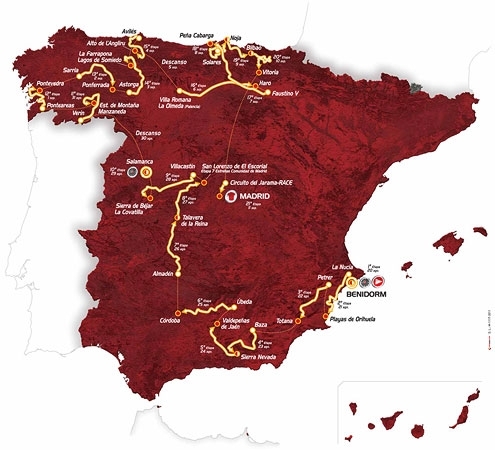 The Vuelta a Espana, the 3rd and last of the Grand Tours, starts tomorrow. It’s the 17th running of the race since it was moved from its original springtime slot to the autumn. As a consequence of its place in the cycling calendar, many of the top riders give it a miss. It tends to be targeted more by domestic riders, as a number in the peloton will have effectively hung up their cleats for the season, while other participants will use it to fine tune their preparation for the World Championships, at the end of September, and therefore may not finish the race. Not so this year, as a number, whose ambitions in the Tour de France were dashed by injury, are riding the Vuelta. So this edition promises to be way more exciting but the lack of time-trialling kilometers and numerous steep summit finishes favour the 60kg when wet brigade, all largely Spanish. This typically perceived lack of depth tends to give the Vuelta less credence than its sibling Tours and, as a consequence, the owners of the Vuelta (Unipublic and now ASO) have tried to inject some excitement into the race, such as last year’s night time TTT in Seville. This year’s novelty sees the Vuelta’s first visit to the Basque country in 33 years and I’ll be there to watch those two stages (19 and 20) before the final leg in Madrid on Sunday 11 September. For a concise and articulate rundown on the Vuelta and it’s likely protagonists, can I suggest you pop over to http://thearmchairsportsfan.com. This year’s race starts in Benidorm which brings back fond memories of a family holiday there when I was 14, many, many moons ago, and my pink fringed bikini. I thought I looked the bee’s knees, and the local male population seemed to concur. My father never let down his guard once, which was probably just as well. Anyway, back to the Vuelta’s 3rd visit to Benidorm, one of Spain’s most popular tourist resorts lying on the eastern Mediterranean coastline between Valencia and Alicante, in the province of Valencia, in a region better known as the Costa Blanca. 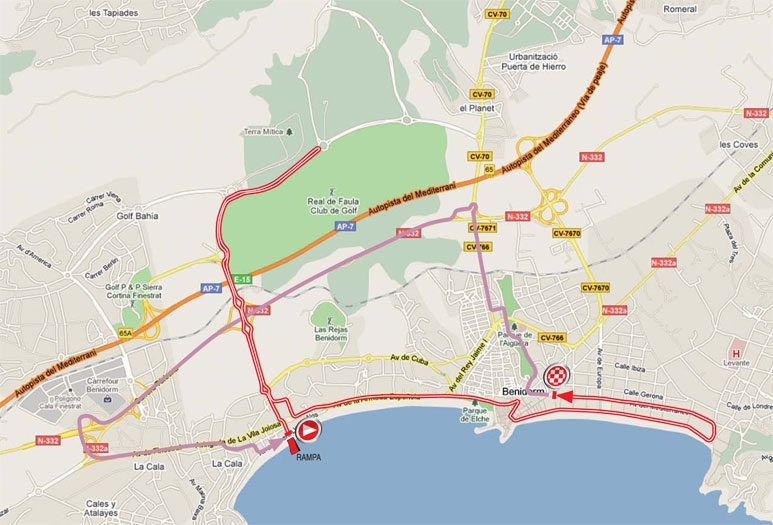 It’s split into four areas: The Old Town, Levante, Poniente, and Rincon de Loix. Benidorm’s Old Town is a maze of cobbled streets populated with bars, restaurants and shops situated on the promontory that separates the 2 main beaches. This was the original fishing village which mutated into a tourist mecca thanks to those long, lovely beaches. The Levante beach area, with over 2kms of golden sand, awash with hotels, theme parks and night clubs, is for the young at heart. It merges into Rincon de Loix, the newer part of Benidorm, which with its mixture of hotels and apartments is popular with the British. The refurbished and recently revitalised Poniente beach lies west of Benidorm’s old Town. Tomorrow’s team time trail actually starts from a ramp on the beach before dipping and then heading back to the coast. With the Spanish still on holiday, and at the b each, expect massive crowds the length of the parcours. It’s short, just 13.5km, so any time differences are sure to be small and not decisive. Nonetheless, riders with GC ambitions, such as Igor Anton from Euskaltel, will start stage 2 on the back foot as his team will most probably finish among the slowest. Tipped for tomorrow’s win will be teams such as HTC High Road, Garmin Cervelo and Radioshack. My interest in the Vuelta has increased because two professional riders I know really well are taking part. While it would be fantastic to see them take a stage, they’ll be riding selflessly in support of their respective leaders, even if one of them is his country’s road race champion. They’re the type of rider that every team leader would like to have in their team and I hope this’ll be recognised when it comes to both of them getting new contracts for next season. Before the return of my beloved tomorrow morning from his recent trip to Australia and Singapore, it’s also useful for me to take stock of my achievements, particularly given how much time I have spent watching the Tour. I’m pleased to report the ironing mountain is much diminished, although I have yet to start on the mending, the administration is complete and up to date, organisation of the forthcoming La Ronde is well in hand, the flat is spotless, the plants are thriving and I have ridden approximately 1000km. I say “approximately” because I have been unable to upload recent data via Garmin Connect. Even though Garmin assures me all my software is up to date, when I try to upload, I receive this message”UnsupportedDateTypeException: Your device is not supported by this application”. Well it was until a month or so ago. My beloved has also been having problems with his device. Every time he tries to upload his Garmin data, the HP Photosmart goes beserk and prints loads of blank paper. We have referred the issues to Garmin technical support and are awaiting a response. They’ve not been overly prompt in getting back to us but perhaps they’ve been kept busy with the Tour. Who knows? My kilometrage doesn’t perfectly correlate with my beloved’s absence, it’s mandated by my training programme to which I try very hard to adhere, at all times. I do however often spend more time riding than given in the programme. For example, today I was supposed to ride for 3 hours, to include an ascent of the Col de la Madone. My coach wants me to ride up some longer gradients ahead of my assault next week on the Alps. During the week, it can take me as long as two hours to navigate the traffic and get to Menton for the start of the climb. It takes me an hour to get to Ste Agnes. So there we are, ride over and I’m nowhere near the top of the Col and a long way from home. I decided to save that treat for Saturday morning when there will be less traffic. I may even treat myself to a light lunch in La Turbie, a mere hour from Ste Agnes, before my 90 minute ride home. Do the maths: for me it’s a 51/2hr ride. Going via Col d’Eze as he suggested, it would still take me 3 hours to get to the top of Lance’s favourite training ride. Next week, I’m down for a couple of hours riding each day. I appreciate that my coach has never been on holiday with my beloved. If he had, he’d know that there’s no way we’re only going to be riding for an hour or so each day. That’s not to say my beloved is going to make me ride all the day’s stage but it’s fair to say that the riders and I will be spending a similar amount of time, each day, in the saddle. That’s where the similarity ends. I’m also very flattered that my coach thinks it’s only going to take me 90 minutes to get up Alp d’Huez. I am also having another run at the Galibier, the more difficult ascent. In my book, cols don’t count unless you ride up them from the steepest side. Hats off to the walking wounded who rode today’s shortish stage won by Andrei Greipel who relegated Mark Cavendish to second place. Surely, the cherry on top of the icing on the cake of his maiden Tour win, in his maiden Tour. Well played by team mate PhilGil who successfully disrupted the HTC train. None of the jerseys changed hands today. They might not change hands tomorrow either on tomorrow’s flattish stage into Lavaur, the Tour’s mid-point, before heading into the mountains on Bastille Day. First up, the Pyrenees. Let there be pyrotechnics! Unfortunately, due to more pressing commitments, I’ve only caught bits of the last few day’s of the Giro. Even worse, I have fallen asleep during transmission of the Tour of California. Why is it that when I watch transmission of the former I am entranced by the countryside, the honeyed stone-walled towns, the sense of history, the wide swathes of sandy coastline while in the latter I wonder why anyone would want to visit, let alone live there? I’m thinking, there’s a lesson to be learnt here. One of the aims of any Tour is to promote the region in which it’s taking place. The Americans haven’t quite got to grips with the concept. Of course, they’ve not been helped by the weather. Meanwhile, over in the Giro, and in stark contrast to last year, the weather has been fabulous. Those pallid, concave, pigeon chests are rapidly getting as tanned as their arms and legs. The last couple of day’s has seen heroic French efforts sandwiched by two Cavendish wins. These wins were not without controversy as the winner allegedly had an assisted ride up Mount Etna on Sunday, thereby avoiding the cut. Cavendish has hotly denied the accusations but my friends in the peloton tell me that not only does Cavendish get a ride from the team car but he’s often pushed over hills by his team mates. No wonder he thanks them profusely after every win. As we bade a fondish farewell to the sprinters, particularly Ale-jet, who are speedily exiting the Giro before the really big climbs, let’s return to the French. Christophe Le Mevel (Garvelo) tried to seize the opportunity and the pink jersey yesterday. His team had been assured that Bert wasn’t fussed about defending it and decided to give it a go. Personally, I was willing Christophe into pink but had to leave before the end of the stage for my English class. It was only on my return I learnt that he’d sadly been unsuccessful. While SaxoBank would have been happy to let the jersey go, other teams wanted to preserve the position on GC of their riders and took up the chase. Thanks to a split in the peloton, Christophe lost time and dropped a place on GC. However, it was great to see him try. Too many riders ride just to defend their position, not to better it. Chapeau Christophe. The win instead went to a diminutive grimpeur (another one who’ll never belong to that select sub-set who weigh more than me) John Gadret (AG2R-La Mondiale) who has a definite empathy with the climbs of the Giro and, with his bald head, a more than passing resemblance to Pantani. Fittingly, he dedicated his win to the late Wouter Weylandt, who’s funeral was held yesterday. As tomorrow’s stage heads into Austria, can I suggest that the teams’ chefs prepare the boys a spot of post-race Kaiser’schmarrn which has to be one of the best things to eat after significant exertion. This dish is made from a rich pancake batter where the egg whites are whipped and folded into the batter to lighten it before cooking it in a frying pan. Once cooked it is shredded, sprinkled with icing sugar (and in my case, rum-soaked raisins) and served with a fruit compote, generally apple or plum – enjoy. Five, four, three, two, one and they’re away. It’s Omega Pharma-Lotto who kick off this year’s Giro. The team descends the starting ramp, rides out the gate of the Castello della Venaria Reale, 9km north of Turin, and speeds away in line along a road thronged with enthusiastic spectators, enjoying both the fine weather and the spectacle. 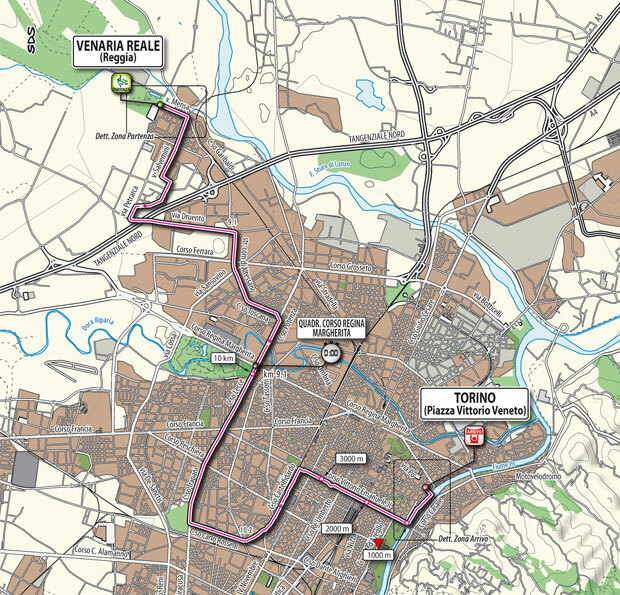 The pan-flat route is more technical at the start, challenging the team’s ability to establish a rhythm, followed by wide straight tree-lined avenues with some 90 degree bends around the old town before ending up on the cobbles. The key to team time trialling is consistency. Invariably you’ll have riders of differing strengths however you need to maintain a speed which everyone can follow. The more able members of the team take longer pulls on the front. Some teams opt for finishing with as many of the original nine as possible, while others progressively spit out riders, crossing the line with the bare minimum (5). Liquigas employed one rider to ride at the back of the paceline to shepherd rotating team members back into line in front of him – neat trick. Italian television showcased the delights of Turin, home to Fiat cars, and its beautiful, old town, which I found quite reminiscent of Nice. Well, they were both part of the House of Savoy. The centre of Turin is the large quadrangular area lying between Corso Vittoro Emanuele, Corso Galileo Ferraris (shouldn’t that be Fiat? ), Corso Regina Margherita, Corso San Maurizio and the Po river. Roughly bisecting this area is the fashionable via Roma, lined with wide arcades, which connects the main railway station with Piazzo Castello. It’s skyline is dominated by extraordinarily shaped Mole Antonelliana designed by Piedmontese architect Alessandro Antonelli. It started life in 1863 as a synagogue and was completed in 1897 as a monument of Italian unity. As to be expected there’s a via Garibaldi, pedestrianised and lined with 18th century palaces. The via Po, to the east of the centre, is full of funky shops, including many bookshops where you would have expected me to pick up a few cycling books and enjoy an espresso in one of the many fashionable cafes. Alas, I never made it to Turin and am beginning to feel that all my Giro trips are jinxed. It started to go downhill on Thursday afternoon at our Commission Kivilev meeting where I raised a number of as yet unresolved issues. Accordingly, I was given the job of sorting these out. I set to with gusto on Thursday evening with a view to leaving early for Turin the following morning. Inevitably, there were people with whom I needed to speak that I couldn’t reach until the following day. By lunchtime, I was still working away. I made an executive decision, I would cancel my hotel room and drive to Turin early on Saturday morning. I’d missed the team presentation, and wouldn’t have so much time to look around Turin, but I would still see the team time-trial. However, without my parking spot in the hotel garage, handily placed for a quick getaway, it was unlikely I would be home in time to collect my beloved from the airport. The weather was fabulous on Friday so I nipped out for a quick ride over lunch, my path crossing that of Amael Moinard. He was descending fast (ergo I was ascending, more slowly) so we only had time to exchange greetings. I returned home refreshed by my ride and continued with my work. In addition, I was trying to organise a celebratory lunch for our friend who’s just signed a contract with a Pro-tour cycling team. The limiting factor in all such arrangements is the availability of my beloved. I had circulated dates, basically a few Friday, Saturday or Sunday evenings over the coming weeks. I had qualified this by saying, he was also available Sunday lunchtime. Later that afternoon, I received a call to say that everyone could make this Sunday lunchtime. A few rapid calculations and I realised that something would have to give and it was going to be my trip to Turin. I planned the menu and wrote out my shopping list. Our friend would be riding the Vuelta, so I went with a Spanish theme: tapas, paella, finishing with the ubiquitous orange-flavoured “flan” with strawberries. We would all be riding on Sunday morning, and our friend’s eldest son was racing, so I went for things which could either be prepared in advance, or thrown together once everyone had arrived. I shopped early on Saturday morning, preparing in advance as many of the dishes as possible, before settling down to watch the time-trial on the television. I looked enviously at the crowds thronging the route in the sunshine and the hordes of Alpini in their jaunty feathered hats, I should have been there: one day. Needless to say it was the well-drilled teams who held sway. HTC-High Road were fastest and contrived to put Marco Pinotti, the Italian time-trial champion and hugely popular rider, into the pink jersey. RadioShack, another disciplined team, were second, with Liquigas securing third place. While the gaps were not, for the most part, significant, it’s still time that has to be won back at some stage. Of the leading contenders, Nibali is the best placed with Scarponi, hot on his heels, at just 2 seconds behind. Lampre arrived into Turin a day early specifically to practise the team time-trial. It paid off. Contador is 8 secs off Nibali, with Menchov and Sastre at 31 secs and Joaquim Rodriguez at 42 seconds. Euskaltel-Euskadi were the team maglia nera, but team leader Igor Anton has revealed that he’s at the Giro just to hunt for stage wins and not the pink jersey. Having garnered a large number of brownie points in Saturday’s time-trail, HTC-High Road might have hoped to cash these in on Sunday when Mark Cavendish was pipped on the line into Parma by an in-form Alessandro Petacchi whom they adjudged to have sprinted off his line, not once but thrice. 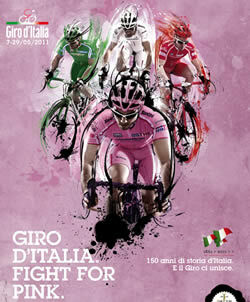 In vain, two stages, two Italian wins: the Giro’s off to a great start. We watched the action unfold on the screen television in the company of our friend who’s ridden the Giro himself and twice been on winning teams: with Marco Pantani (2002) and with Alberto Contador (2008). It was interesting to hear his observations on the riders, the parcours and the race. As is the case with television commentary, the most brilliantly observed remarks are those from past (or even current) riders who understand intimately the ways and language of the peloton. They add colour, insight and comprehension for the observer. Thus it was with us all gathered around the television after a relaxing and enjoyable lunch. However, we’re going to have to do it all over again as one couple were missing from the celebration. The husband had been knocked off his bike early on Sunday morning and was under observation in the local hospital for facial and cranial injuries. It’s not serious, just painful, and we all wish him a speedy recovery. If you’re seeking an excellent summation of the first two stages of the Giro d’Italia, please pop over to www.thearmchairsportsfan.com. My coach has a company which promotes the health benefits of participating in sport. You can either join for a year or buy tickets to participate in events. The first go is free. This Saturday he was encouraging people to either start cycling or get back on their bikes. His existing clients are also invited to participate. I went in anticipation that there just might be a few people slower than me. No such luck! We were a fairly select group, composed largely of his existing clients and just one guy who “hadn’t ridden much recently”. No need to spell out who was bringing up the rear on the ride. One of my coach’s assistants came with us and solicitously enquired as to whether I was finding the parcours too difficult. My coach kindly stepped in to explain that I was his official Lanterne Rouge, a role I perform beautifully and to the very best of my ability. Frenchmen are such charmers! We only rode for about 90 minutes, ideal preparation for Sunday’s La Lazarides, one of the more testing brevets and one which I rode well at last year. I spent Saturday afternoon on numerous household tasks while checking out the sporting action on our three televisions. WBA v Villa was shown live on Canal+ and I have to say the boys played well. But, and it’s a big but, they were mugged by the Baggies 2-1 who played with greater purpose, despite being down to 10 men. Meanwhile, in the lounge I was intent on watching the qualifying for Sunday’s Portuguese GP from Estoril. Typically, the favourites all ended up on pole position. Finally, I watched the time-trial in the Tour of Romandie where Messrs Evans (BMC) and Vinokourov (Astana) were poised to knock Pavel Brutt (Katusha) from the top step of the podium. It wasn’t an easy course, although the winner Dave Zabriskie made it look easy as he posted the fasted time. In the post-race interview, I feared for the interviewer’s life when he unwisely suggested that Dave Z (Garvelo) had only won because of more favourably climatic conditions. While that was true, that’s cycling, it’s sometimes the luck of the draw. Superb times were posted by Tony Martin (HTC-High Road) and Cadel Evans lifting them into second and first place respectively. Vinokourov clearly gave it his all but fared less well. He still managed to round out the podium, leaving the race poised for an interesting finish on Sunday. Would Vinokourov attack Evans and Martin? Sunday dawned with perfect weather conditions for cycling. We rose early and drove to the start in Cannes. We set off with the group cycling 150km although we intended to ride only 100km. I do this largely out of concern for those manning the broom wagon, I don’t like to keep them waiting. Within a couple of kilometers I was distanced from the peloton which had sped off into the wide blue yonder – plus ca change! My beloved kindly kept me company as we wended our way through the positively lush countryside in the L’Esterel, around Lake St Cassien and up into the surrounding walled villages. I was not riding well and was feeling positively fatigued. On the climb up to Mons I gratefully climbed off and into the waiting broom wagon. I positively hate giving up but sometimes you just know it’s the right thing to do. I had a pounding headache and felt really tired, even though I’d only ridden for 50km. I chose to forgo the end of ride sausages and wine, I didn’t feel I’d deserved them. Once back home and installed on the sofa, ready for an afternoon’s sporting action, I promptly fell asleep. My beloved roused me from to time to time to observe some of the sporting action or, more correctly, replayed sporting action. In the Rund um den Finanzplatz Eschborn – Frankfurt, Johnny Hoogerland (Vacansoleil) greatly enlivened the race by attacking at every opportunity but Leopard Trek were determined to deliver Fabian Wegmann, last year’s winner, to the line. However, it was another German who took it on the line. John Degenkolb, last year’s world championship runner-up in the U23 catergory, took his third win of the season for HTC-Columbia. The U23 champion, Michael Matthews was 3rd. The roadside was thronged with spectators enjoying the action in the warm sunshine. Cycling clearly isn’t dead in Germany despite the efforts of the German television stations to banish it from air. On the run into Geneva, on the final stage of the Tour of Romandie, as anticipated, Vinokourov made one of his trademark attacks but was brought swiftly to heel by Sky who set up the win for Ben Swift, ahead of Oscar Freire. The podium remained unchanged. Evans was clearly delighted to bag his second Tour of Romandie title, after the disappointment of missing the Ardennes Classics, in the region where he lived when he came over to Europe as a mountain bike racer and, fittingly, not too far from BMC’s HQ. However, it’s been a good week for Astana with stage wins for Alexandre Vinokourov and Valentin Iglinsky, and podium finishes in the Tours of Romandie (3rd) and Turkey (Andrey Zeits 2nd). I managed to remain awake long enough to catch all of the re-run action in the MotoGP from Estoril where the track had been made more difficult by patches of wet from the morning’s rain. Nicolas Terol posted his 3rd consecutive win in 125cc class ahead of Victor Faubel and Sandro Cortese. He easily heads the championship rankings. In the Moto2 class, Stefan Bradl won his consecutive Estoril title but not before a tussle with Andrea Iannone who, having zoomed from 17th place into first, slid out of contention to finish 13th, leaving Bradl to record another win ahead of Julian Simon and Yuki Takahashi. It was an emotional podium place for Takahashi who had recemtly lost his younger brother in a motor racing accident. Moto2 rookie, and last year’s 125cc champion, Marc Marquez slid off into the cat litter (again) and has yet to score any points. In the main event, Dani Pedrosa showed that the recent surgery on his shoulder has worked. He marked Jorge Lorenzo closely before using the slipstream to overtake him 4 laps from home. Casey Stoner was a comfortable 3rd. It wasn’t a classic race as such although there were exciting jousts within the main race. Andrea Divisioso overtook Valentino Rossi on the line for 4th place. Marco Simoncelli crashed out (again). Now there’s a wheel you don’t want to follow. Finally, OGCN were trounced 4-0 at home to Caen. This was a six pointer and they now find themselves one place, and one point, above the drop zone. There are four other teams on 39 points all of whom have superior goal differences. Come on guys, please don’t fall at the last hurdle! Many of my French acquaintances were surprised to learn that I wouldn’t be watching today’s Royal Wedding. I certainly wish the couple every future happiness but, following my sister’s bash, have had my fill of weddings for this year. Instead, I spent a few pleasant hours mooching around Aix-en-Provence, while my beloved visited a client. It poured down en route but by the time we arrived the sun was shining on Aix’s cobbles. We breakfasted in a local hotel which serves the best breakfast I’ve ever had in France, outside my own kitchen. After my beloved had departed, I spent time discussing recipes with the lady who’s responsible for the afore-mentioned gastronomic delights. Needing to walk off the calories, I strode around Aix, largely window shopping, though I did purchase dinner (asparagus and strawberries) in the local market. Architecturally, Aix is a beautiful town with plenty of honeyed stone buildings decorated with wrought iron balconies and impressive porticos over intricately carved wooden doors. The town’s been sensitively renovated and it’s a pleasure wandering along its narrow lanes, particularly in the old town, listening to the tinkling of falling water in one of it’s many fountains. I last visited Aix with my parents and it brought home to me how much they had both slowed up. Neither are particularly confident on foot, particularly on cobbles. 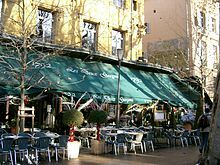 I ended up leaving them to enjoy a coffee and newspaper in the famous Les Deux Garcons, so beloved of Cezanne and Hemingway, where we later enjoyed lunch. They say that old age is fine providing that you’re healthy, have a bit of money and your wits about you. However, to that I would add that you need your partner to be healthy and have their wits about them too. Otherwise, like my Dad, your situation is totally compromised. He’s now reluctant to go many places or do many things for fear of what my mother might do. He’s very sensitive to the opinion of others and doesn’t want my mother to embarrass either herself or him. Her very unpredictability leaves him constantly on edge and unable to enjoy many of the simple things in life. Nonetheless, he’s unwilling to consign my mother to the care of others, unless they’re close friends or family. This is taking a toll on his own health and mental fortitude. I’m popping back to the UK next month to spend a couple of days with them while my sister is on vacation. My father is very reliant on her and my brother-in-law which is not without its own stresses. However my own commitments, geographical location and lack of daily flights to Birmingham outside of the summer months make it difficult to be of much practical assistance. Once back home from Aix, we were delighted to see Alexandre Vinokourov (Astana), in true opportunistic fashion, nip off behind Tony Martin (HTC-High Road) in the home strait of today’s stage of the Tour of Romandie and win. He’s now just 38 seconds behind Pavel Brutt (Katusha) and 10 seconds ahead of Cadel Evans (BMC). I’ve also been checking out the practice sessions at the MotoGP in Portugal. There’s plenty of sporting action to enjoy this week end, as well as our own participation in Sunday’s La Lazarides. Having waved farewell to my beloved on Tuesday afternoon, I have spent the last few days enjoying the warm, sunny weather which I hope is here to stay. I’m trying to rebuild my form with some longer rides. At the same time, I’ve a whole host of paperwork to deal with as it’s the end of the first quarter, plus deadlines for filing accounts and tax returns are fast approaching. Additionally, the club is keeping me busy as we attract ever more members. I have found time, thanks to the tv in the office, to keep abreast of proceedings in the Driedaagse De Panne-Koksijde. This is generally a race for those whose ambitions have to be put aside on Sunday while they support their team leaders, although Ballan did win both this and the Tour of Flanders in 2007. It’s raced around the Belgian coastline which is prone to fierce, peloton splintering, cross-winds. Riders who have showed promise elsewhere this year largely prevailed. The first stage on Tuesday, 194km from Middelkerke to Zottegem, was won by Andrei Greipel (Omega Pharma-Lotto), the lone sprinter in a 4-man break. He assumed the leader’s jersey only to lose it on the following day’s lumpy 219km to Koksijde. It was gratefully assumed by Liewe Westra (Vacansoleil-DCM) although the stage winner was Denis Galimzyanov (Katusha) who managed to hold off John Degenkolb (HTC-High Road). This morning’s 111km sprint stage around De Panne was held in the rain, consequently a number of riders opted not to start : most notably, Alessandro Ballan (BMC), Peter Sagan (Liquigas), Filippo Pozzato (Katusha) and Stijn Devolder (Vacansoleil-DCM). The sprint for the line from the leading bunch of around 50 riders was won by Jacopo Guarini (Liquigas) who managed to stay just ahead of Galimzyanov. Over 70 riders finished outside the time limit, so there were only 56 competing in the afternoon’s individual time-trial. Last man off was Bert De Backer (Skil-Shimano) who had taken the leader’s jersey with a sprint bonus that morning. But there were 27 riders within 10 seconds of him, including some notable chrono men. The sky was overcast and there was some rain on part of the course towards the back end. The biggest factor was once again the wind on what looked to be quite a technical course. Sebastien Rosseler (RadioShack) comfortably won the time-trial and the overall. Westra was runner-up, once again, despite the frenzied and manical urgings of his DS from the team car. Although, for consolation, he had the climber’s and most combative jerseys. De Backer won the sprints jersey and Galymzyanov the points one. Third-placed man on the podium was Rosseler’s team mate, 20 year-old Michal Kwiatkowski who had turned in a very fine performance in the time-trial. A Belgian winner on Belgian soil, just what the organisers and spectators wanted.